HANK PHILLIPPI RYAN: Do all crime fiction readers devour the newspaper? (I still read three a day, and on paper!) Every crime story I see, I think—is that a plot for me? And often, I decide I could never use them, because no one would believe them. Real life is infinitely surprising, terrifying, coincidental, unusual, unique. Crushingly sad. And—haunting. When we least expect it. What a riveting backstory to day—from the incredibly talented Stephanie Gayle. I’m from a small town. East Bridgewater, Massachusetts. Population: almost 11,000 when I last lived there. That was 1993, the year I graduated high school. A half-year earlier Kent “Rusty” Taber Jr. was stabbed to death in my small town. He lived in an apartment over the funeral home where he worked part-time as an embalmer. It was very big news. People weren’t stabbed to death in my small town. And the funeral home detail? Made it even spookier. Twenty years after that brutal killing, I wrote my first mystery novel, Idyll Threats. And it wasn’t until I was amidst my copyedits that I realized how much Mr. Taber’s murder had influenced my thinking about policing and murder investigations in small towns. 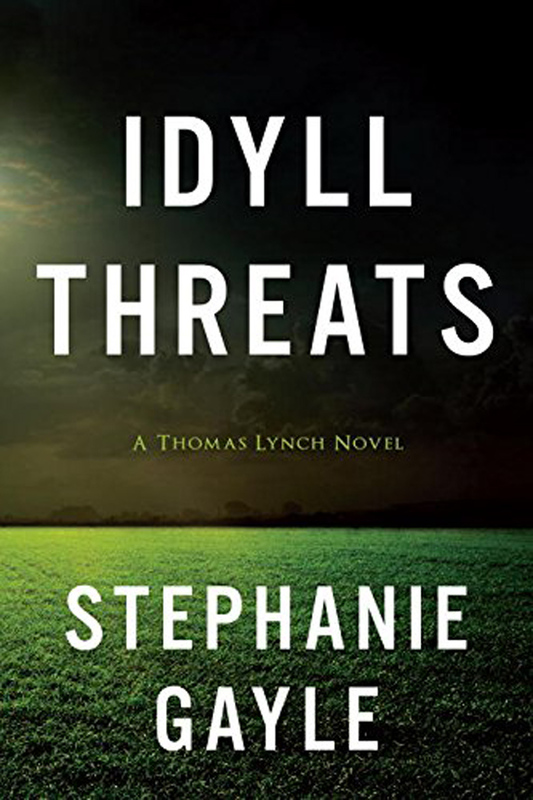 “When are we calling the Staties?” is something that Chief of Police, Thomas Lynch, hears constantly during the murder investigation I created in Idyll Threats. The locals in his small town don’t think his police force with its one and a half detectives, is capable of catching a killer. This is the exact refrain I heard from locals (including my family) during the search for Kent Taber’s killer. “When will the staties be called?” And eventually the staties were contacted to help, though they didn’t crack the case. My fictional crime is more easily resolved than the true-life crime that inspired it. By book’s end the killer in Idyll Threats is identified and arrested. Kent Taber’s murder remained unsolved until seventeen years later when Christopher Colucci was indicted for the crime. Colucci had worked with Taber. Someone reported that Colucci reacted badly to an advance made by Taber. Five years after the murder, Colucci was involved in a car accident that left him paralyzed. He was deemed incompetent to stand trial due to the mental debilitation that resulted from the accident. I’d been gone from my hometown so long, the news didn’t reach me. I thought Kent Taber’s killer was still at large. It wasn’t until after I’d finished my novel that I thought to look up the case. It was then that I learned of Colucci’s arrest. And of Mr. Taber’s family’s disappointment at not having Mr. Colucci stand trial for his terrible crime. It made me grateful for my fictional world, where I can dispense justice in a way the real world sometimes cannot. It took time for me to realize how pivotal one small town murder was in shaping how I thought about crime. I was quicker to realize that my second book, which features Chief Lynch investigating a kidnapping of a small boy, also owes a debt to history. The second biggest crime sensation of my life? The kidnapping and murder of a small boy from a nearby town. I can still see the yellow ribbons tied round the trees, the ribbons that tattered and faded after the boy had been found and buried. Violent crimes live on in our emotions, our thoughts, and memories. Sometimes more than we realize. And for me, the blood turns to ink and spills out, many years after the original crime. HANK: Yes, Stephanie, so true... we can “dispense justice in a way the real world sometimes cannot.” And yet we devour the truth, since it’s a path to understanding. So, Reds and readers, what do you think? And do you still read newspapers? How? Electronically, or on paper? 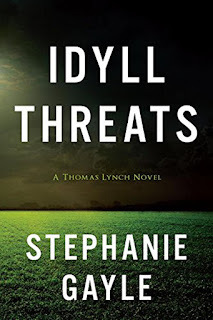 StephanieGayle’s mystery, Idyll Threats, earned a starred review from Booklist. Her first novel, My Summer of Southern Discomfort, was chosen as one of Redbook’s Top Ten Summer Reads. 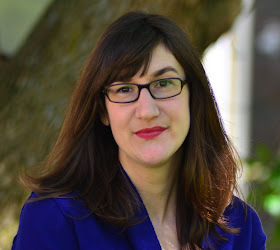 Her short fiction and non-fiction have appeared in Kenyon Review Online, The Potomac Review, Punchnel’s, and other publications. She’s twice been nominated for a Pushcart Prize. She co-founded the popular Boston reading series, Craft on Draft. She tweets under @stephoflegends. I definitely read the newspaper [either on paper or on my computer] and I watch local and national news broadcasts. I have to agree: there's definitely a much-appreciated dispensing of justice in books that is often lacking in real life. One of the things that I find most interesting is that the reaction to a crime such as murder is often very different in small towns than in metropolitan areas, perhaps because such things generally don't happen in those little towns that somehow manage to remain insulated from the harshness of the big cities. Terrific essay Stephanie! I think hearing about a terrible crime or event as a kid makes a huge impact, whether we realize it or not. I'm thinking about the background of my psychologist character in the Advice Column series--lifted right out of my grade school neighborhood. Because then we can take a horrible event and really push on the question of why something happened, and as you say so nicely, serve justice in the end. And yes Hank, I read the New York Times at breakfast, lunch, and during breaks, and the Key West Citizen of course! Great post, Stephanie. I too lived in small towns--the kind of place where a kid could knock on a door and ask to use the bathroom without fear. Small town murders have far more shock (and memory inducing) value than those in larger cities, not only because you knew the victim, but because of the fear that you know the killer. And Hank, three papers, online because no home delivery in my area. I MISS the NYT crossword. The news is the same on line, but there is something special about the printed crossword. But besides the Times and Globe and Herald, I get a wonderful précis of stories (with links) from the Washington post-and I have to say, its terrific. Oh, Kait I need thought about that---that you might also know the killer in a small town. Huh. WHere we grew up, the kid next door burned down our barn. I was--gosh, 16? and ..it's a long story, but the kid was maybe 7. The family moved away soon after. I often wonder what happened to him Kevin, was his name. Terrific essay, Stephanie. Isn't it interesting how sometimes you don't realize how much you're affected by something until you find it echoing in your writing? That's what happened to me with the Lana Turner/Johnny Stompanato murder which took place when I was ten, 2 blocks from where I grew up... it ended up inspiring my last novel. So interesting the way you took the leap from the Kent “Rusty” Taber Jr. and wove it through with so many themes that resonate today. I grew up in a small town (really small--under 5000) and live in an even smaller one now. For high school English ( or maybe it was social studies) we had to subscribe to the NY Times but almost everyone got their news from the NY Daily News or from Huntley and Brinkley. My father avoided them all, on the theory that it was all bad news that was covered and he didn't need to know. I seem to have inherited a little of his attitude. I watch local and NBC nightly news on TV but the only newspaper I read is our little online local the Daily Bulldog. A question: with the exception of those whose characters are in the news business, how many mystery novels ever mention someone reading a newspaper? I've had my sleuth, when she knew she'd be on it, watching the news on TV, but I think that's about it. Why am I not surprised most of you still read newspapers (no matter what form they come in)? Kathy, that's an interesting question you pose. I feel as though characters (esp. detectives) in older mysteries were often seen reading the newspaper. Today, not as much. Oh, that is such a great question..Jane, of course, rads the newspapers (she write for one) and watches T news-she's on it, from time to time. ANd doesn't anyone who lives in the real world have to get the news somehow, some where? Although someone said--and, sadly, I can't remember if it's real life or if I read it in a book--"If its something I need to know, some one will tell me." Reading the newspaper is not a very active thing, you know? MAybe that's why it's not in crime fiction novels? There's a scene in Agatha Christie's Nemesis, in which Miss Marple is reading her morning newspaper. We get a description of how she approaches it, what she reads first, what she scans, what she saves for last. She keeps a pair of scissors handy, in case she wants to clip out something of interest. She's even opinionated about how stories are placed on the page, or continued in the back pages. The act of reading a newspaper takes time, and it's filled with stories--not soundbites. It's like choosing a book over an ebook--a different experience of reading, absorbing. Especially for hometown papers--imagine his delight when my nephew opened the paper to find a photo of himself on the front cover, starring in last spring's school musical. A photo, moreover, that still hangs on the fridge. The paper is lying there, on the coffee table, the chair arm, the nightstand--you walk past the news--good, bad, uglier than you could dream of--you look for follow-up stoies in the next edition--it's just different if you read that news online, I think. Sorry, that should read "stories"
And I STILL clip articles. Ridiculous, I know, but if I don't I'll simply forget about them. Stephanie, your back story about Kent "Rusty" Taber's murder and how it influenced your writing is fascinating. It also struck a familiar chord with me. Just suffice it to say that there was an unusual murder in my small town when I was a young teen, and it has stayed with me throughout the years as a possible source for writing. My father was friends with the man whose wife was murdered, and the man's life was shattered not only by his wife's death, but the fact that it was another family member who committed the murder. With more than one family member in the house when it occurred (not the husband), there was always a lingering doubt as to whether the right person was charged. I do read the newspaper every day, print version. It's a part of my routine, and I feel rather at a loss without it. FChurch, I love the reminder of how Miss Marple read the newspaper. Her newspaper habits helped endear her to me all the more. Stephanie, I can't begin to imagine how hard it would be for a police chief to hold in the information of being gay. I am definitely intrigued by your novel, and it will go on my TBR list. Stephanie, I love the premise of your novel. It would be difficult for a new police chief in a small town to come out even today, I'm afraid. Flora, thanks for the reminder of Miss Marple and the newspaper! As Hank says, reading a newspaper is not a very active thing for a character to do, but I think we're becoming over-conditioned to think that everything in a novel has to be action, action, action. I love those quiet little character building moments. And this made me think about whether my characters read newspapers. Yes, they do! Newspapers are so prevalent in the UK, especially in London. What newspaper someone reads is also such an indicator of class, education, and political leanings. Tabloids vs. broadsheets; right wing vs. left, in both types of papers. And almost everyone in London reads the Evening Standard, which is now free and is given away everywhere. I read updates from the NYT online (and UK papers), but I still take the Dallas Morning News seven days a week (one of the best papers in the country, I think) and the NYT Friday through Sunday. I still clip things, too, because, like Hank, otherwise I won't remember... I canceled my DMN subscription for a while and found I really missed it. Oh, yes, reading the papers, on Sunday morning, with coffee and breakfast? One of my absolute highlights. Do you all do that? Or how? BRILLIANT, Debs. Maybe read the paper while running. Or hit someone with the newspaper. While running. And yelling. Absolutely I read the local newspaper. If I had to read it online I would probably quit. And it's so handy for swatting wasps that get in the house! I save the papers for a neighbor who takes them to an animal shelter. I also skim through the Wall Street Journal, mostly the travel, personal, and book reviews. Stephanie, I like the sound of your book. The police chief sounds like a good but troubled soul due to his having to hide his personal life. Can't wait to read it. I still get the The St. Louis Post-Dispatch because my dad did, but I don't read as faithfully as I ought, especially if I'm in the middle of a page-turner of a book. You've pointed to the advantage of novels: the problems reach resolution. I want the bad guys caught and the world set back to rights. Thanks for doing that for us. Friends online or in person tend to mention most things I do need to know, and if I start feeling guilty about the stack of unread papers, I remember Thoreau's comparison of newspapers to gossips over their tea. Eventually, though, I do get back to those papers, and watch the news go backwards as I work my way down the stack. I've read newspaper articles that made me think, "That would make an amazing novel!" but sometimes the coincidences in such articles strain credulity. And oddly fiction is held to a higher standard of non-coincidence than non-fiction. One such article I never forgot was about two sisters who lived far away, in opposite directions, who ended up colliding in a head on car accident that killed them both and some of their children. We don't get the newspaper anymore. I was heart breaking to stop, but it was going directly to the recycling most days. The news paper I preferred went all online a couple years ago and so did I. I miss it. My grandfather worked in circulation in the Bay Area in the 50's and 60's so I grew up with newspapers. It doesn't matter where I get my news though, it's all fodder for stories. What I find very interesting are the number of online sources for news that wouldn't have been considered for real news in the pre-digital age. I just read an interview with a photo-journalist about living and photograph in Yemen on Refinery29, which would have been a fashion and gossip magazine at the newsstand. It makes me think maybe younger people have more access to the news because it's seeping in everywhere. Oh, yes, indeed, the"news", the way we receive it at least, is so "different" from what we're used to. Agreed, Stephanie, and yes, that;s a story that could only be..true. Thank you SO much for being here today! Storyteller MAry---watching the news go backwards. I love that! Thank you!